The common refrain, actually a cliché about the NBA, is the playoffs begin a new season and nothing much matters before then. If so, the Bulls will sign onto that as they finished a difficult, irregular and probably their most injury plagued season ever Wednesday with a 95-92 victory over the Washington Wizards. The Bulls will open the playoffs 7 p.m. Saturday in Brooklyn. Game 2 will be Monday with Games 3 and 4 back in the United Center Thursday and Saturday. Noah was in his second game back from nursing his plantar fasciitis and played a tentative 14 minutes with zero points and one rebound. He seems to be pacing himself more for conditioning and getting the feel of playing with his foot problem. Gibson was returning from his knee sprain and had eight points and four rebounds in 21 minutes and came on the longer he was in the game. 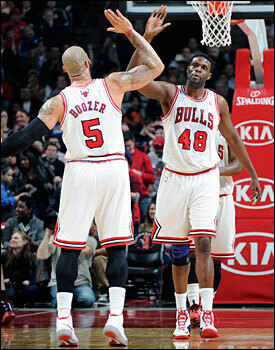 Health, or the lack of it for many players, was the story of this 2012-13 Bulls season. The internal consensus seems to be, especially against a Nets team against whom they were 3-1 despite three to five regulars out in every game, if the Bulls can field a full team even without Rose they can make something of a playoff run. Of course, if the Bulls were to win the series with the Nets, which they will come in as underdogs with the fifth seed and without the home court edge, they presumably would face the Miami Heat, who play the Milwaukee Bucks. That seems largely the reason the Atlanta Hawks benched virtually their entire team the last two games to lose and get out of the bracket with Miami. Atlanta will open in Indiana. But first things first, that being a trip to Brooklyn for a Bulls team that Wednesday blew out to a 21-point first quarter lead and then hung on after the Wizards tied the game at 85 with 3:19 left. But the Wizards never did get a lead in the game as the Bulls went on a 7-0 run from there highlighted by a Richard Hamilton lob for a Jimmy Butler dunk, a Luol Deng three and Gibson coming out to block a potential tying three by high scorer A.J. Price with 10.1 seconds left. It was a strong sign for Gibson, now wearing a brace to protect his knee. The Bulls Wednesday in closing the season at 45-37 got 19 points and 15 rebounds from Carlos Boozer for his 44th double-double of the season and an average of 18.7 points and 12.3 rebounds the last 16 games. Nazr Mohammed was a big surprise starting for Noah with a season high 17 points, including nine in the first quarter which he added to Kirk Hinrich’s 10 to get that big lead. Hinrich was seven of nine and the Bulls are now 14-1 when he shoots at least 50 percent. He added 18 points and Jimmy Butler had another solid game with 13 points. Given that three of the four games between the teams this season were settled by four points or fewer and the Nets had double digit leads in all the games, it would seem most, if not all, will come down to the last minutes. Though that’s the way first round four/five matchups are supposed to be as those should be the most evenly matched teams. The Nets, though they are in the middle of the league in scoring, have the potential to be a big strike team with Deron Williams, Joe Johnson and Brook Lopez. They all are offensive oriented players, though all like to play isolation and dominate the ball. It thus will be on the Bulls defense to react and help as the Nets’ offense has been coming on strong the last month with the Nets scoring at least 100 points in eight of their last 10 games and six of their last seven. They closed the season winning six of those last seven. So it’s perhaps an appropriate denouement to an unusual and in many respects rewarding season for the Bulls facing so many injuries and the loss and uncertainty regarding Rose all season. Still they had big wins over Miami and New York and big losses to teams like Charlotte, Sacramento and Phoenix. But the team responded with gritty performances and resiliency. “I’m really proud of the season because it wasn’t easy,” said Noah. “We’ve been through a lot. There were a lot of distractions, a lot of adversity, a lot of injuries. Regardless of what was thrown at us we fought hard throughout it all. I’m really proud of my teammates for that. There were times guys were looking at our team and laughing there were like seven or eight guys on the bench. We never gave up. We weren’t supposed to even make the playoffs. That’s something everybody should be proud of. Now it’s playoff time. Let’s go! Noah said his foot was improved and he was looking toward the next two days for progress. And so it is time. And in the cauldron of the playoffs, the Bulls feel in some respects this was the kind of season to prepare them. Perhaps not many others do. But they like their chances.